Background: In recent times sustainable organic transformations are the challenge for the chemist in areas like environment, health, social sector and to overcome these troubles, it is planned to develop simple and facile methods to carry organic reaction under benign media. Literature survey revealed nano magnetite supported heterogeneous catalysis is a growing field in catalytic science with huge application in organic synthesis. So in this present article our focus is on the synthesis of nanomagnetite supported cysteine organocatalyst and their application in organic synthesis. Methods: Nanocat-ferrite-L-cysteine was prepared by simple stirring technique in aqueous media followed by dehydration technique. The prepared catalyst is well characterized by some analytical system like FT-IR, TEM and FEG-SEM-EDS spectroscopy. This functionalised nanocat-Fe-Cys was employed in the synthesis of bis(indolyl) methanes under solvent-free conditions. The % conversion of products was checked by thin layer chromatography and the synthesized compounds were further confirmed by NMR techniques. Results: To check the competency of synthesized nanocat-Fe-Cys for bis(indolyl) methanes reaction, a benign one step transformation reported under microwave irradiation method superiorly over conventional oil bath method. The products were obtained in very clean & noticeably higher yield (80- 94%). The catalyst ferrite cysteine was found to be recyclable for ten times without any remarkable damage in catalytic activity. Conclusion: In present research article, the synthesis of highly active, recyclable & versatile organo nanocatlyst ferrite-cysteine reported using easily available precursor via the simple impregnation method. The MNPs was found to be stable under investigated conditions & highly effective in the synthesis of bis(indolyl) methanes derivatives. The simple eco-friendly method, mild reaction conditions, economically affordable and good product yields concentrate this attractive sustainable protocol. 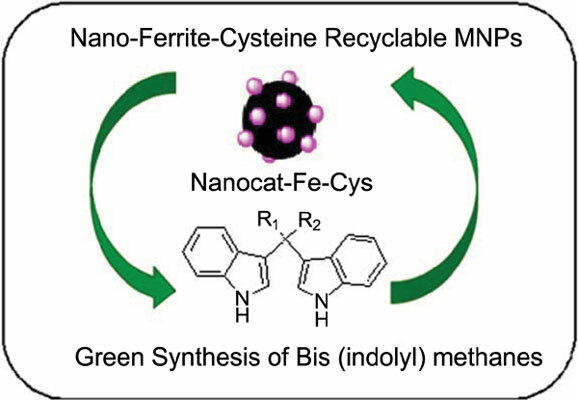 Benign media, bis (indolyl) methanes, green transformation, Nanocat-Fe-Cys, organocatalyst, heterogeneous catalysis.